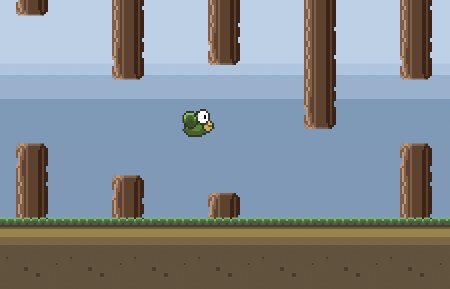 In this Tutorial we will learn how easy it is to make a game like Flappy Bird in Unity. Flappy Bird was released in 2013 and became the most downloaded iOS App in January 2014. 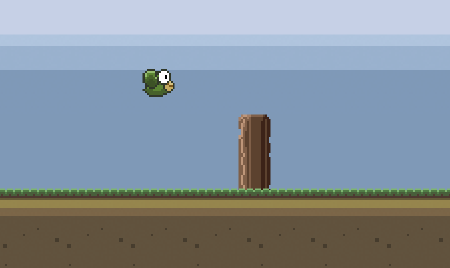 The gamedesign is very simple: a bird is supposed to fly horizontally between obstacles, and the player can press a button to make the bird flap and fly upwards. 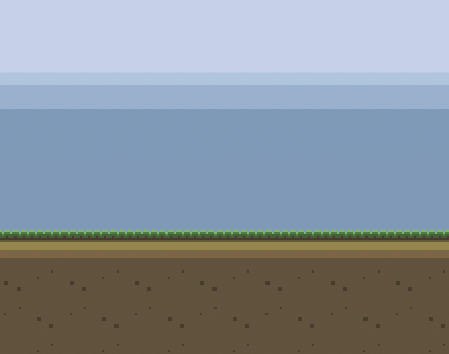 Simple games like that are always perfect for a Tutorial, all we need are 40 lines of code and a few sprites. Our Tutorial does not require any special skills. If you know your way around Unity and heard about GameObjects and Transforms before, then you are ready to go. And if you didn't, don't worry about it too much. 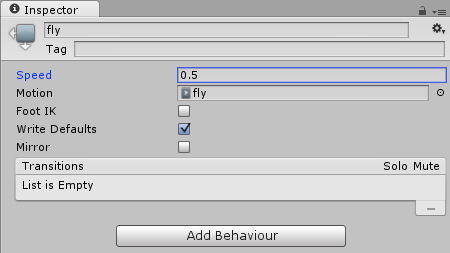 Our Flappy Bird Tutorial will use Unity 5.0.0f4. Newer versions should work fine as well, older versions may or may not work. The free version of Unity 5 now comes with all the engine features, which makes it the recommended version. Note: a Pixels Per Unit value of 16 means that 16 x 16 pixels will fit into one unit in the game world. 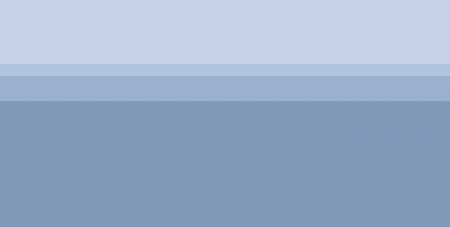 We will use this value for all our textures, because the Bird will be 16 x 16 pixels, which should end up being 1 unit in the game world. Now that the background is a child of the camera, it will always go where the camera goes. Or in other words, the player will always see the background. Note: we could also place several backgrounds next to each other so that there is still a background when the camera moves horizontally, but making it a child of the camera is much easier. There is one more adjustment to be made here. We will add the bird and some obstacles soon, so let's also make sure that the background is really drawn behind everything else. Unity uses the SpriteRenderer's Sorting Layer and Order in Layer properties to decide which parts of a game should be in front of which other parts. Note: the higher the order, the more it is in the foreground. The lower the order, the more it is in the background. Note: this time we won't make it a child of the camera. Normally we would be done now, but there is one more adjustment to be made here. 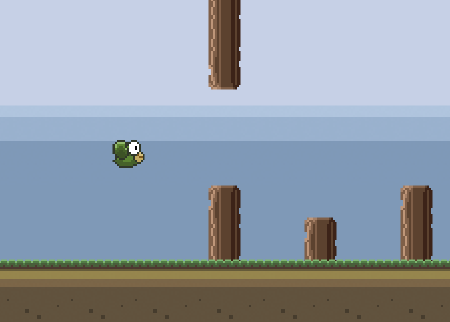 Later on we will add obstacles to our game (like the green pipes in the original Flappy Bird game), and those obstacles will move upwards and downwards into the ground. The obstacles and the ground will both be part of the physics world, and according to the laws of physics, there can never be two objects at the same place (or in our case, two Colliders). There are several ways to work around this. As usual we will choose the easiest way by creating a new physics Layer that we will use for the ground and the obstacles. Afterwards we will tell Unity to simply ignore collisions in-between that layer. Note: it's very rare that we have to do this in Unity, but our Flappy Bird game is one of those exceptions. Now the ground will never collide with any of the obstacles. After pressing the Slice button we can close the Sprite Editor. Unity will ask us if we want to apply the Unimported Import Settings, so let's select Apply. Unity knows that we want to create an animation from those slices, which is why it asks us where to save the animation files. We will create a new BirdAnimation folder and then save the animation as fly.anim. Note: we don't have to worry about the animation states because we only have one animation. Our bird already looks pretty decent, but it should also fly towards the right at all times, and it should flap its wings to fly upwards if the user presses a button. Note: the velocity is exactly the movement direction multiplied by the movement speed. If we save the Script and press Play then we can see how the bird flies towards the right of the Screen. Note: Application.LoadLevel can be used to load a Scene. Application.loadedLevel is the currently loaded Scene. Or in other words, we simply restart the current Scene. Right now the Camera never moves. And since the bird always flies towards the right of the screen, we won't be able to see it for a very long time. We will solve this problem by creating a new Script that makes the Camera follow the bird all the time. Note: we can set that target in the Inspector later on. Note: the X position is the horizontal position. Note: since we disabled collisions in-between our WeirdPhysics layer, the ground will never collide with an obstacle. The bird can still collide with the ground and with the obstacle because it has a different layer (the default one). There are many different ways to make the obstacle move up and down all the time. As usual, we will use the easiest way. Note: the Switch function simply reverses the Rigidbody's velocity. We then use InvokeRepeating to tell Unity to call that function every few seconds. We also added a switchTime variable to specify the time in which Switch should be called. Note: if we don't want an obstacle to move then we can either set it's Speed to 0 or disable the Script. 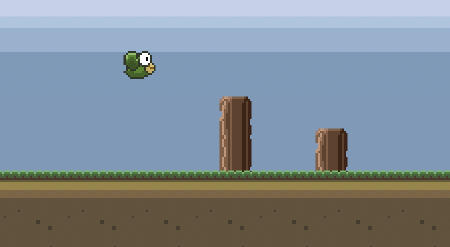 We just learned how incredibly easy it is to make a Flappy Bird game in Unity. We used some very powerful Unity features like Physics, Mecanim (for the animation), Layers, the Sprite Editor and Scripting. As usual now it's up to the reader to make the game fun and more difficult. The Project Files can be download here.